I got featured on one of my favorite healthy living blogs, (never)homemaker! I’ve been friends with Ashley through Twitter for a few months and I submitted my story about a week or so ago for their Healthy Living Stories. It went up yesterday, and you all can check it out here! I was so touched by the reader response, plus I’ve gained about ten new followers because of Ashley’s spotlight! Thank you so much, Ash! That’s actually not too far off from what I have now, although looking back I can see exactly where I went wrong. Since I was away from all of the fats and triggering foods, I didn’t have them to tempt me. When I got around them again, I was a freak and ate my way through nine tubs! And some days I wouldn’t even eat that much. I’d have an Odwalla bar or a juice for breakfast and then a sandwich for dinner, and green tea in between. Granted, I’d sleep very late. But still. No excuse. My day had to be turned around a little bit due to real-life events (all of them wonderful and good, I promise) so my meals were a bit off-kilter and I didn’t get to go to New York. I attempted a speed drill known as a fartlek on the treadmill this morning, but I could only get through about four of them before calling it a day. I think my body is still trying to fight off this sickness and I haven’t been giving it proper rest, plus my breathing was out of whack due to this bad cough 😦 I still managed to bang out 4.5 miles, though, which I considered a small victory! Breakfast was eaten late, at least for me. I didn’t actually get to eat until 9:30! Good, but not nearly icy or creamy enough. 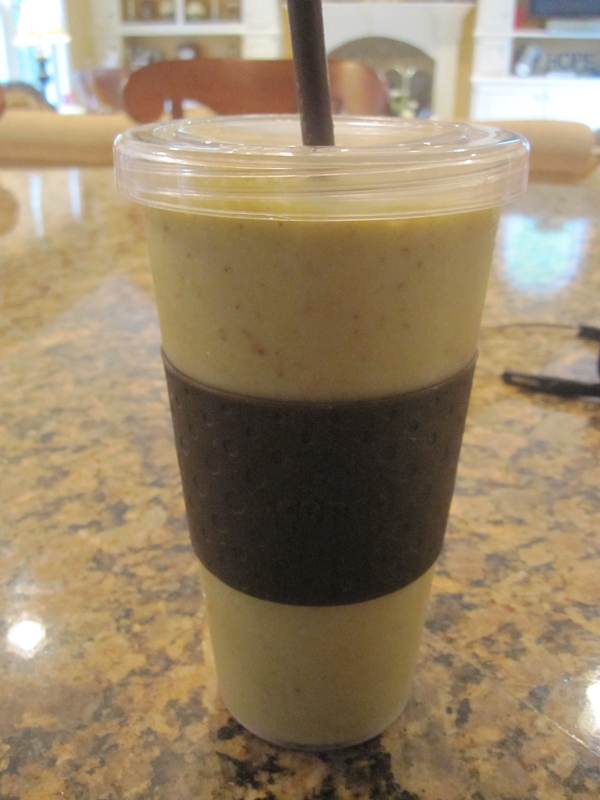 I like Almond Breeze but Silk is much thicker and sweeter, creating a thicker, sweeter smoothie. On the side I enjoyed a Mixed Berry Vitamuffin with a smear of Dark Chocolate Almond Butter and agave nectar. 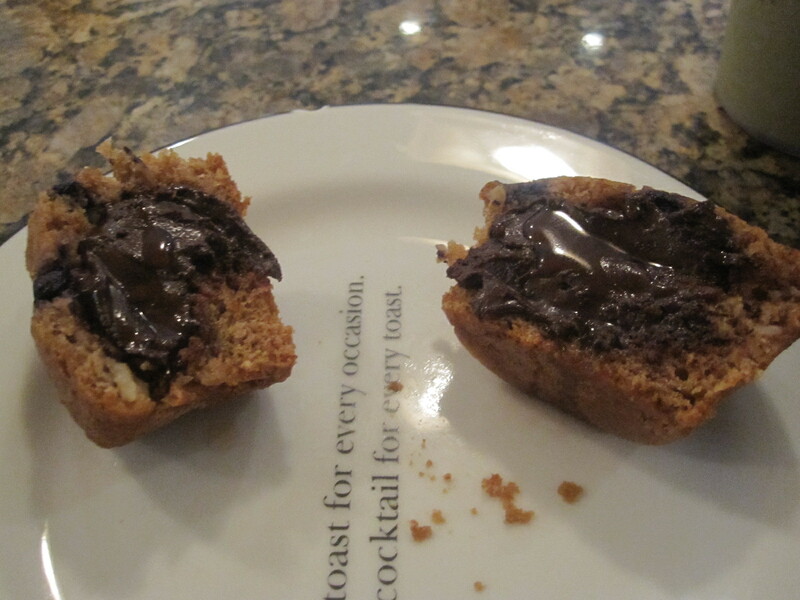 The almond butter melted into the Vitamuffin and got all gooey. MMMMM. The muffin itself was good but SO TINY. I was thoroughly unimpressed when I pulled it out of the freezer. But it’s got tons of nutrients so…I guess I recommend it? It was pretty delicious, though, for being so dinky. 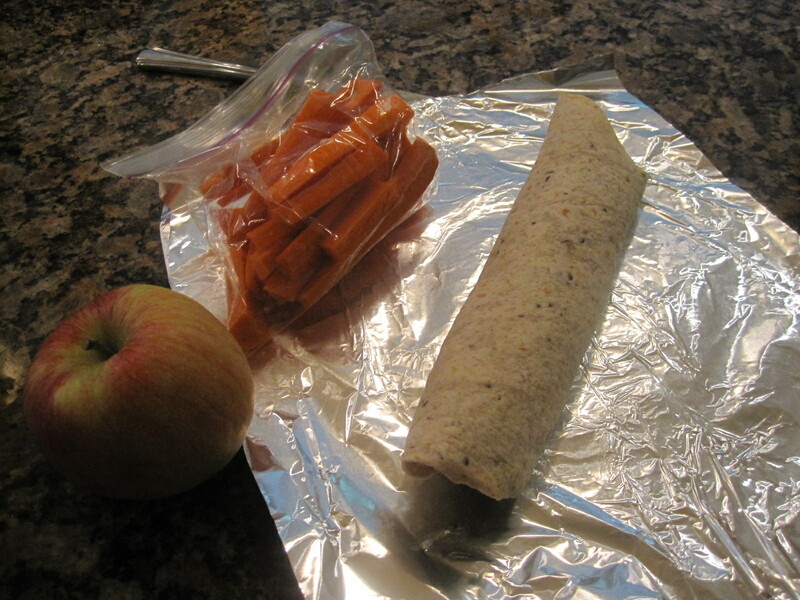 Lunch was packed up due to some errands I had to run in West Hartford: sliced up carrots for a midmorning snackathon and a turkey/avocado/spinach wrap. I packed the apple but ended up not eating it. I went to Trader Joe’s to pick up some sushi and a few other things, and I was standing in line for the checkout and suddenly a wave of panic hit me. My stomach suddenly started growling. Well, it wasn’t so much growling as it was roaring. It wanted food and it wanted it now. My sandwich was waiting for me in the car. Waves of panic rolled over me as I waited in line to pay for my purchases. I felt uncontrollable panic attacks begin, and I started to sweat. Eat! Eat or you’ll pass out! Eat now! my mind screamed at me. Then it came my turn to pay. I suddenly stopped, breathed, placed my items down on the belt…and the panic went away. I was still hungry, but I just breathed and told myself “You will eat in five minutes. Calm down. You are not going to pass out. You are fine.” And lo and behold, I was. I think it was all due to the fact that a) I’m still sick and b) I probably pushed myself a little too hard on the treadmill this morning and c) my stomach has been constantly upset all day. I ate my sandwich (delicious and creamy) and all was well. When I got home, I needed a little snack to tie me over until dinner. 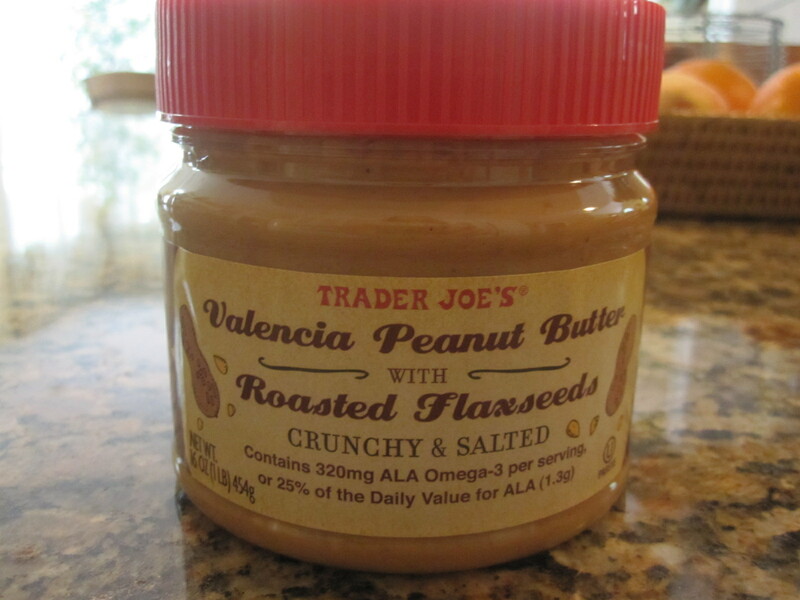 A perfect time to pull out THIS bad boy, one of my Trader Joe’s purchases! I believe the words out of my mouth when I tasted this peanut butter were along the lines of “HOLY HELL.” This is the best peanut butter I have ever had. And I have been known to have ten jars of the stuff in my pantry. Is it the crunch of the peanuts? The added zing of the flaxseeds? The beyond-creamy yet chunky texture? I have no idea. All I know is I had to stuff it in the back of my freezer because I was going to eat the entire jar. 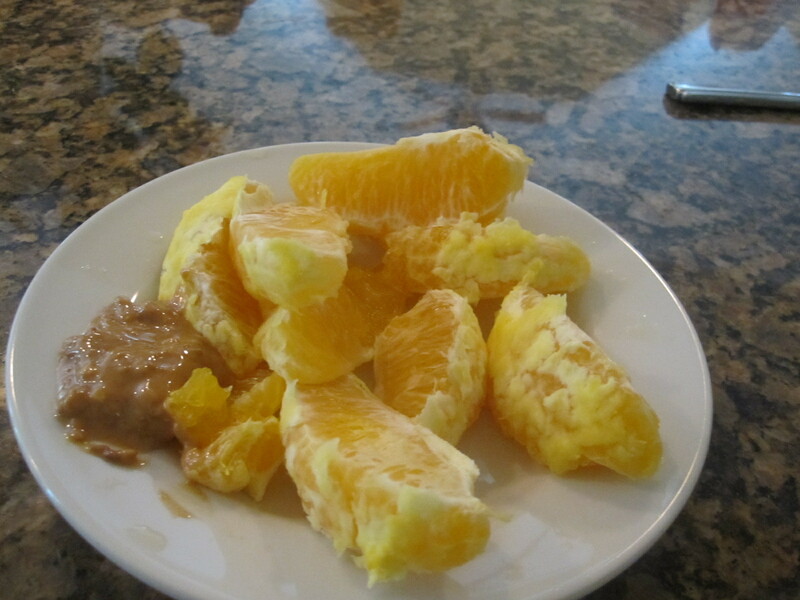 I managed to stick to my serving on the plate and enjoyed my orange slices dipped and smeared in this miracle stuff. Next time I MUST try it with an apple! Or on bread. Or on oatmeal. Oh my God. I’m having it with everything tomorrow! Also, I drank a diet soda. 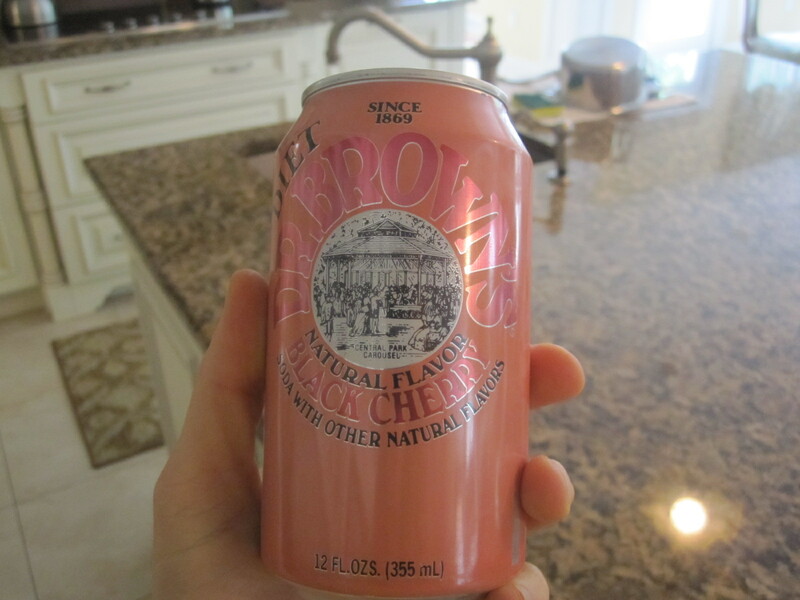 I have no idea why with my IBS I was possessed to drink a Diet Cherry Soda. But it was delicious, and I relished every sip. Then I took a loooong nap on the couch, and slept right through my snack time! I don’t think I would’ve had anything of note, though…I was full from the carbonation and the peanut butter! My dinner was…oh boy. I had such high hopes for my dinner. 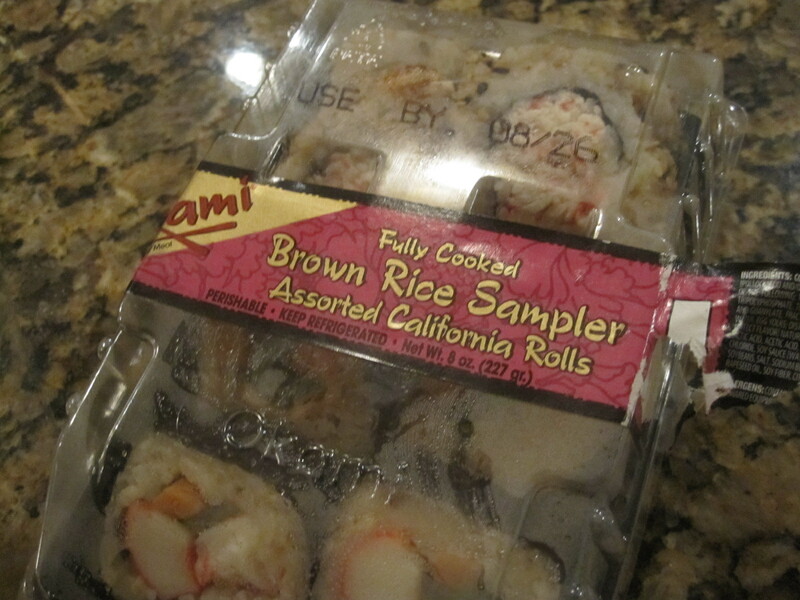 I had purchased a combo pack of sushi from Whole Foods, plus some shelled edamame. 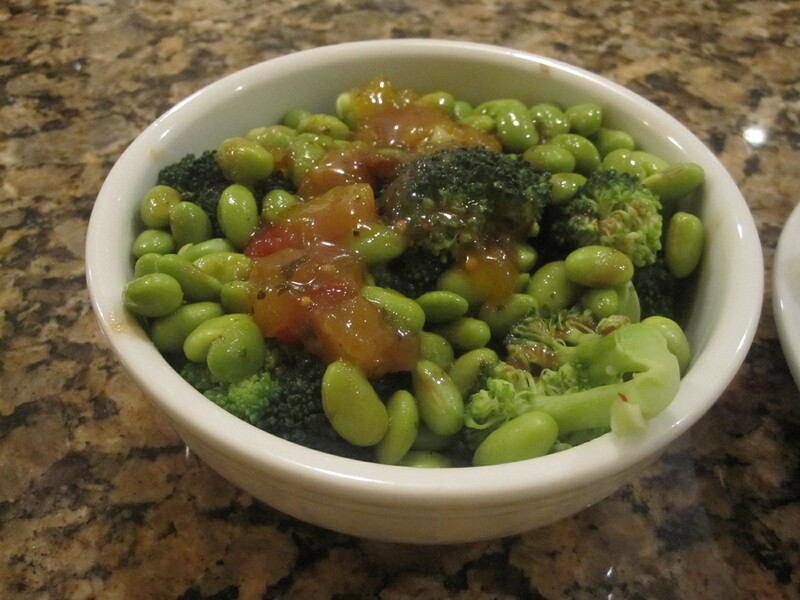 I thought it would be a great idea to steam some broccoli along with the edamame and top it with some peanut sauce, along with the mango chutney I’ve become obsessed with. 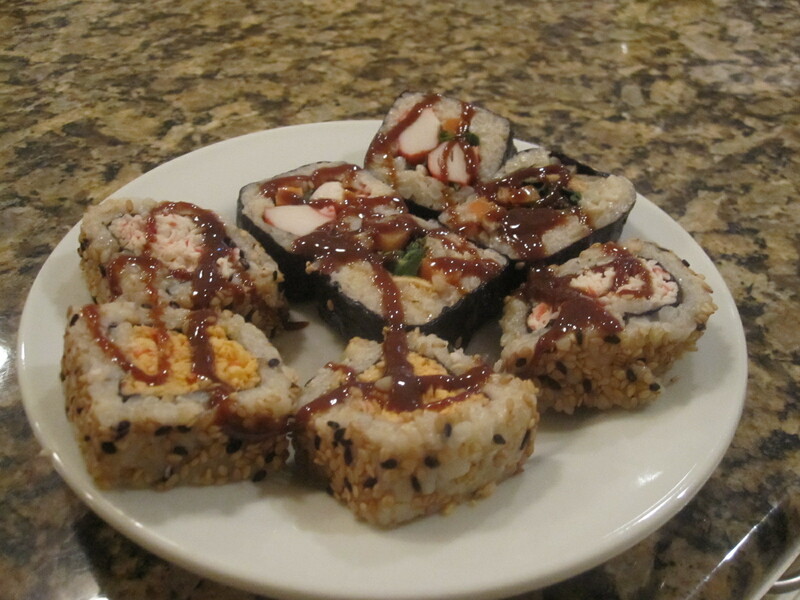 I’d then drizzle some Marmite (I know, I lost my mind) on top of the sushi, and have an eclectic, delicious dinner. Yeah. It didn’t turn out nearly as good as I thought. The broccoli made the peanut sauce and the chutney watery, and the Marmite on the sushi? Oh my God. Nowhere near as good as soy sauce. I ended up trying to wipe most of it off and just dumping more mango chutney on top of it. Uggh. But the sushi itself was good. I was just bummed they didn’t have rice paper summer rolls. Those are my favorite. 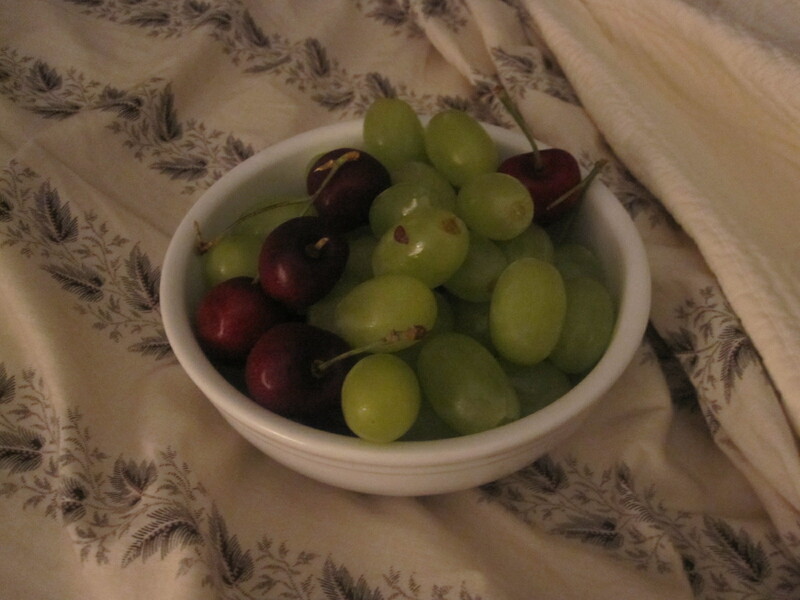 For dessert, I had a bowl of grapes and cherries. Grapes are just now coming into season and they are so big and delectable! 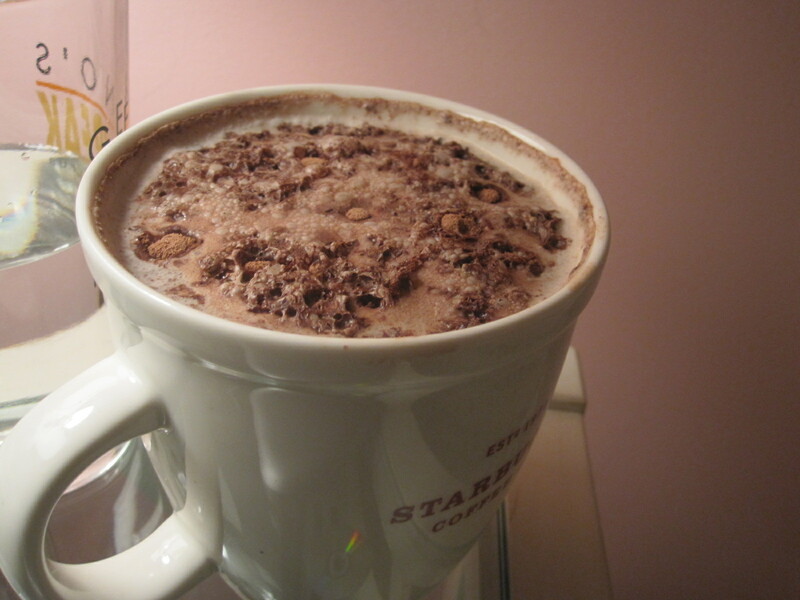 And I also had a mug of Swiss Miss Diet Hot Chocolate. Secret: I use two packs of this stuff, plus a few shakes of cinnamon, plus stevia. It gets super sweet, plus the topping turns into a kind of burnt sugar. Off to watch some television and get some much-needed rest. I’m sleeping IN tomorrow. My body needs some rest to kick this cold for good! I'm trying to lose the last 10 pounds, and I recently had to stop running as much because of a knee injury… and I've felt like hopping on the elliptical isn't cutting it, but I'm SO glad I read this tonight because now I won't feel like I'm wasting my time when I hit the gym in the morning. I've been elliptical-ling it up lately for my knee's sake, but I just don't get that rush afterways, but at least it's better than nothing! The elliptical is a GREAT alternative for someone who has bad knees! It's actually the reason why I never bothered to run until this year, I just figured my knees were better suited for the elliptical! The intervals you can do on the elliptical are fantastic, it leans and tones your legs like nobody's business, and an hour can burn up to 750 calories! Hi There – I saw your post on never home maker and thought I'd stop by! I wish we had the kind of selection of nut butters you guys have (I'm in the UK) peanut flax sounds amazing!